It appears there could be a potential settlement in the wings after representatives from Apple and Samsung were ordered (PDF) by Judge Lucy Koh of the San Jose District Court to meet in the next 90 days to discuss and hopefully come to a resolution in regards to their ongoing patent war. It's not the first time a settlement has been offered, but it does appear to be the first genuine attempt by both parties to come to a suitable resolution. 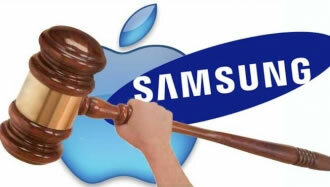 Although agreement to meet for mediation was not compulsory, both Apple and Samsung agreed to the sessions before the order was signed by the District Judge. US District Judge Koh has presided over a number of cases between the two phone and tablet makers at a time when both sides were having mixed successes in the courtroom. According to the order, the meetings will be moderated by US Magistrate Judge Joesph C. Spero. The meetings, which will include Apple CEO Tim Cook, as well as Samsung's counterpart, Gee-Sung Choi, will be held in San Francisco in the hope that both parties can resolve their disputes over various hardware and software patents covering phones and tablets. Both companies have filed suits and counter-suits against each other in the last year. It all started after Apple filed a suit claiming that Samsung's products were "slavishly" copying their iPhone design, then followed on with similar claims regarding their iPad tablets. Samsung responded by suing Apple claiming they were infringing on ten of their patents. Both parties ramped up the pressure filing multiple lawsuits in over 20 different countries in a bid to get each other's products banned from sale. If no resolution can be agreed, a streamlined version of their claims and defenses will then be submitted back to the court.